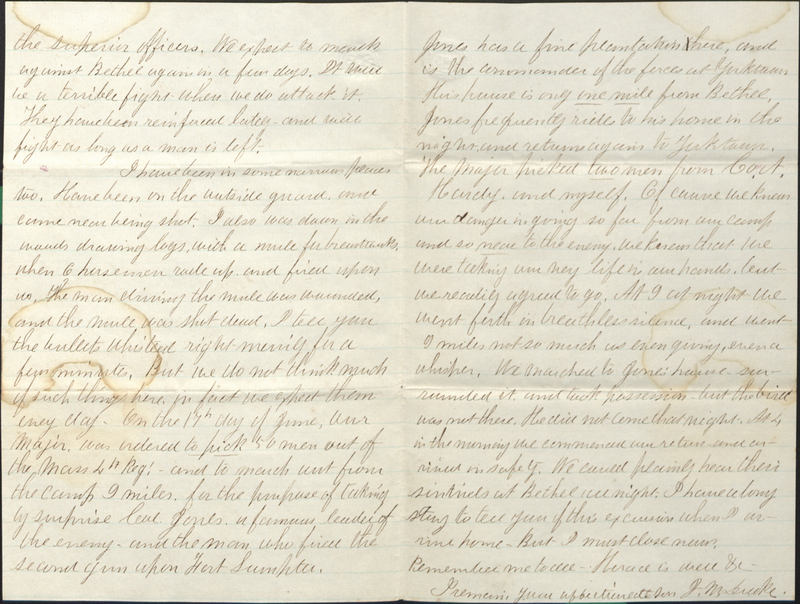 Item description: Letter from J. M. Drake of Company A, 4th Massachusetts Regiment, at Camp Butler, Newport News, Va., to his father, telling of his hopes that his company will be discharged soon; detailing the wrongs done by U.S. Army soldiers in Virginia; sharing his experiences when detailed to go under flag of truce to bring back the dead following the Battle of Bethel; and describing his role in a nighttime mission that was intended to capture Col. Jones, C.S.A. Item citation: Unit 6, 25 June 1861 in the Federal Soldiers’ Letters #3185, Southern Historical Collection, The Wilson Library, University of North Carolina at Chapel Hill. Having a few leisure moments this morning. I improve[?] 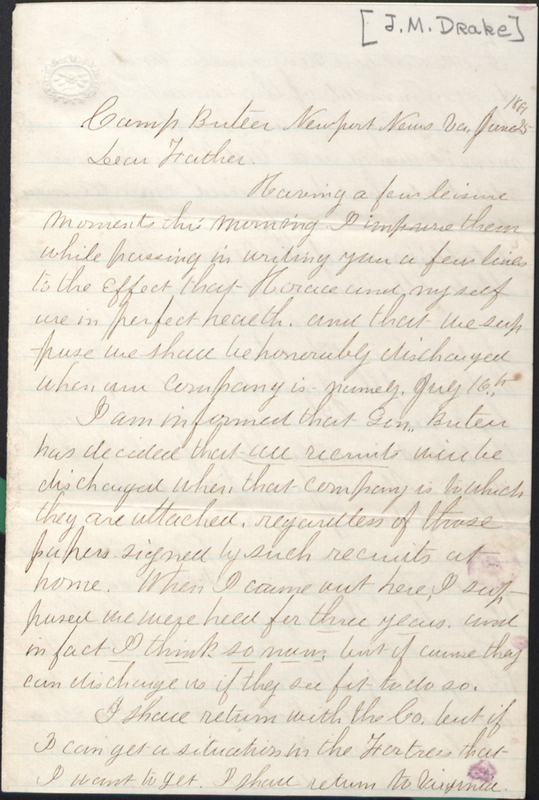 them while passing in writing you a few lines to the effect that Horace and myself are in perfect health, and that we suppose we shall be honorably discharged when our Company is, namely, July 16th. I am informed that Gen. Butler has decided that all recruits will be discharged when that company is to which they are attached, regardless of those papers signed by such recruits at home. When I came out here, I supposed we were held for three years and in fact I think so now, but of course they can discharge us if they see fit to do so. I shall return with the Co. but if I can get a situation in the Fortress that I want to get, I shall return to Virginia. I like out here very much and I am daily reminded of the remark I have often heard you make that if you should move it would be to “Old Virginia,” that old state that has raised smarter men, done more and suffered more for the establishment of the Union than any other State of the Union, if history is true. We are located on a lonely spot – a beautiful farming country, on the banks of the James River. Corn and wheat looks well. The negroes are now reaping the wheat, and have been for the past 10 days. Also in front of our line is a forest of hard pine, the most beautiful trees I ever saw in respect to size. And for lumber purposes. I can’t say anything about the people, for are but the Negroes left on our landing here. Men that had property to the amount of $100,000 left all and went to Richmond and Yorktown. It looked wrong to me to see their hearthstones thus made desolate, and it is a fact that much injury and wrong has been committed by our soldiers. Just contrast [?] with theirs. Our wounded that were left in that murderous and disgraceful affair at Bethel were by the enemy sent to Yorktown and are very humanely treated and were well cared for. Our dead they recently buried not even so much as taking from their person the least thing. I know this to be true because we went there with a flag of truce to recover our wounded and dead. They showed us the spot where they buried our men and we dug them up. One man had in his pocket quite a sum of gold – a nice gold watch and chain – and various other ornaments of value, all buried with him. 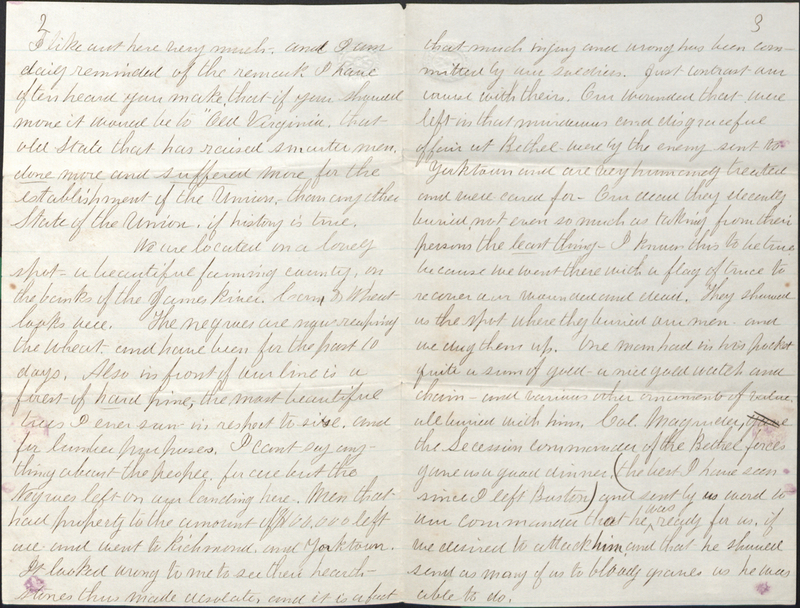 Col. Magruder, the Secession commander of the Bethel forces gave us a good dinner, (the best I have seen since I left Boston) and sent by us word to our commander that he was ready for us, if we desired to attack him and that he should send as many of us to bloody graves as he was able to do. We had in that fight 30(?) men killed and not less than 100 wounded. We had there just 3800 men and the enemy not over 600, and if we had 6000 men we could not have taken that battery from them, and our officers and men too, think so now. The trick is we have been too ready to believe that the South can be easily subdued, but it is not so. Gen. Scott says, “we have an enemy to fight, brave and smart, and our equal in every respect but numbers,” and we begin to fully believe it. The sad result at Bethel has taught our army a lesson. All that saved our men from being all cut to pieces was the poor shooting from the enemy. They shot too high. Trees at the height of 8 & 10 feet were all cut to pieces. [?] and canister had cut down everything. Had they shot breast high not one in 10 of our men would ever have left that field. Much blame is attached to Gen. Pierce but he is no more to blame than all the rest of the superior officers. We expect to march against Bethel again in a few days. It will be a terrible fight, when we do attack it. They have been reinforced lately and will fight as long as a man is left. I have been in some narrow places too. Have been on the outside guard, and came near being shot. I also was down in the woods drawing logs with a mule for breastworks, when 6 horsemen rode up and fired upon us. The man driving the mule was wounded and the mule was shot dead. I tell you the bullets whistled right merrily for a few minutes. But we do not think much of such things here. In fact we expect them every day. On the 17th day of June, our Major was ordered to pick 50 men out of the Mass. 4th Reg. and to march out from the camp 9 miles, for the purpose of taking by surprise Genl. Jones, a famous leader of the enemy, and the man who fired the second gun upon Fort Sumpter. Jones has a fine plantation there, and is the commander of the forces at Yorktown. His house is only one mile from Bethel. Jones frequently rides to his home in the night and returns again to Yorktown. The major picked two men from Co. A., Hardy and myself. Of course we knew our danger in going so far from our camp and so near to the enemy. We knew that we were taking our very life in our hands, but we readily agreed to go. At 9 at night we went forth in breathless silence, and went 9 miles not so much as even giving even a whisper. We marched to Jones’ house, surrounded it, and took possession but the [?] was not there. He did not come that night. At 4 in the morning we commenced our return and arrived in safety. We could plainly hear their sentinels at Bethel all night. I have a long story to tell you of this excursion when I arrive home, but I must close now. Remember me to all. Horace is well. I remain your affectionate son. 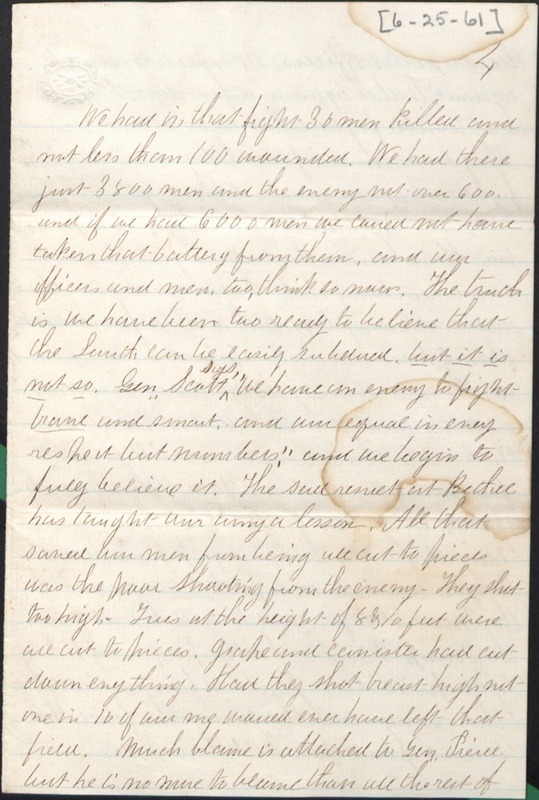 This entry was posted in Southern Historical Collection and tagged 4th Massachusetts Regiment, African Americans, Battle of Big Bethel, burials, Camp Butler, casualties, J.M. Drake, Massachusetts, Newport News, slaves, Union soldiers, United States Army, Virginia. Bookmark the permalink.